Some people spend all their time finding ways to cure ailments or finding new atoms or researching their ancestors. Me, I just came off a multi-year quest devoted to a staircase near the Jungle Cruise boathouse. That's just how I roll. 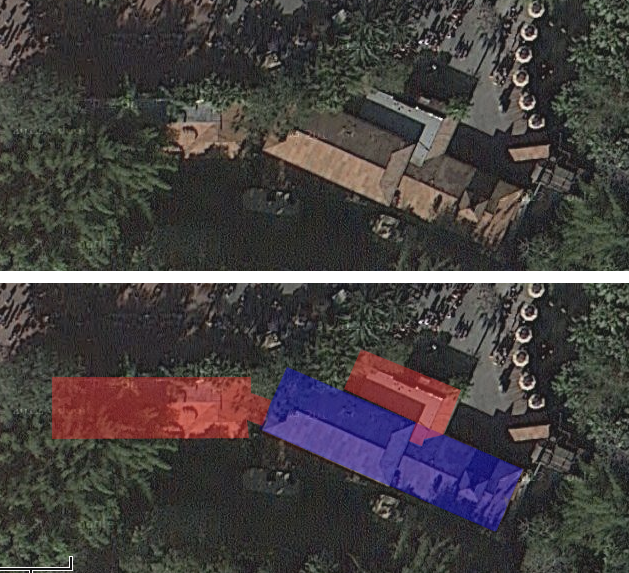 The question is whether or not this second level of the queue building was either intended for or, moreover, actually used for guest queue. This is our first mystery. Yes, so, I've proved again and again that the stairs existed. But these steps aren't the only lingering Jungle Cruise mystery: check out this home movie from December, 1972. Once again it's 8mm so the quality isn't so hot, but it provides, amongst other things, a very good overview of something I previously hadn't been able to find: a view of the front of the Jungle Cruise entrance complex prior to 1973. See the shadows on the ground at the bottom left? Those are shadows of the drumming Tiki Gods seen above. 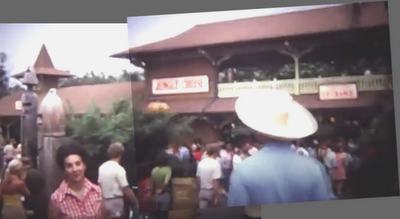 The lady in the red plaid blouse in the upper film frames is probably standing about where the person all in red is standing in the bottom promotional image. 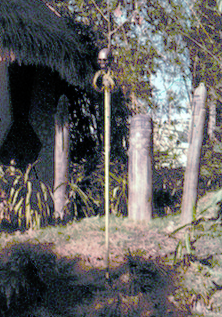 Those Tikis Gods are our second mystery. The tikis would of course been placed in such a way to cause as minor a traffic disturbance as possible, but you can only push them around in the above simulation so much and still it's obvious to see how the mere construction of the forward-facing queue extension required not only the reconstruction of the hill into more compact steps but pushed the tikis out of the already-crowded courtyard in 1973. 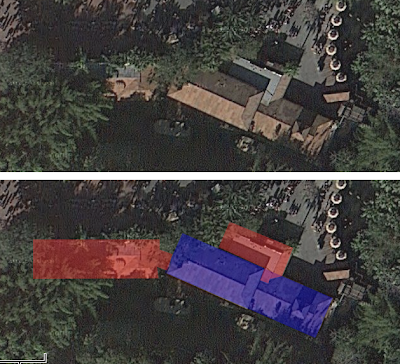 Until additional evidence appears, this is the most logical answer to our second mystery: the Tikis moved because the forward-facing part of the Jungle Cruise queue expansion and the new narrower, steeper steps which replaced the original gradual slope would have required them to be moved anyway and it made more sense to get them out of a congested courtyard. Besides the very interesting original signs, this shows something even better. 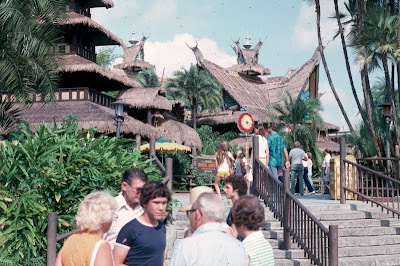 Remember that this is December 1972, at the peak of the busy season. Walt Disney World has been open for 14 months and a new round of construction is sweeping the park to bring air conditioned shade structures to such popular attractions as Haunted Mansion and 20,000 Leagues Under the Sea. That sea of humanity outside the Jungle Cruise? 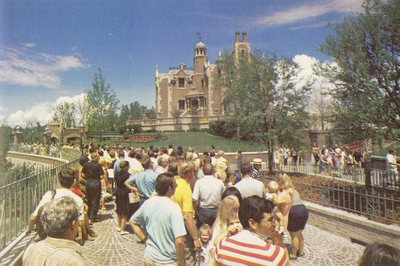 That's the line for Adventureland's only E-Ticket attraction. The line is so huge it's spilled out beyond the official boundaries of the queue and is filling part of the courtyard. Yet there's clearly nobody in the upstairs part of the queue! And my longstanding question bites the dust. If Disney isn't using that space for queue with a line like this, then they never did. That upstairs section was purely decorative and the stairs were removed because they were in the way of perfectly good queuing space. So that is a lot of questions that 4-second little clip of home movies answered. But wait, it resolved a third question! "Amid all the excitement, there are the sounds of the jungle animals, including the noisy but unseen claw and fang combat of two ferocious jungle cats. 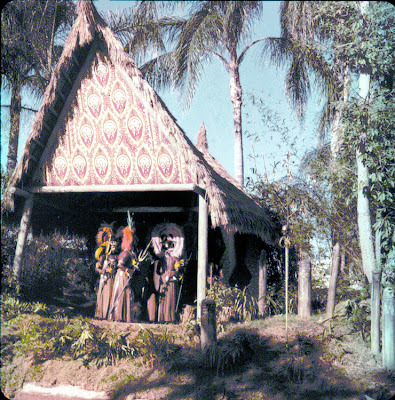 Nearby, natives rise from the undergrowth, threatening with spears poised, while back around the last bend painted warriors continue the ritual of their ceremonial dances near burning skulls, swaying to the mysterious throbbing of tribal drums." The fact that this single detail is apparently missing draws attention to itself. 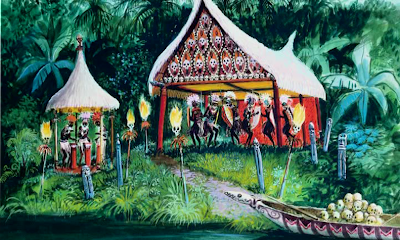 Were there ever burning skulls in the Jungle Cruise? Can I just marry you already?! You could write about the exact shade of "Go away green" and I would read every word! Amazing! Now that this is solved, I have to say, the Jungle is still mysterious. Once again, I find myself hanging on every word you put into each article. Excellent post! 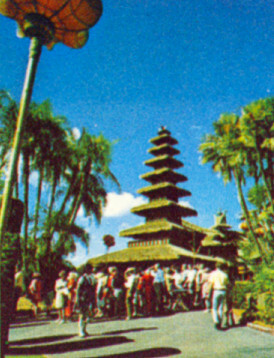 Makes me want to dig through my old pics of the World, but my first visit to the MK was in Dec. of '73, so I know I've got nothing that pertains to this. As always, keep up the great work. It's truly appreciated! Great investigative work!! I love this kinda stuff! Why was there a upper level anyhow? Was it for musicians? Did Disney intend to use it for a que overflow? Was it to hide the actual jungle depth?? You are probably very correct that Disney never used the upper level for guests, but to play devil's advocate: one picture from a single busy day cannot prove the upper level was NEVER used for guests. Maybe on this busy day, the paint on the railing was still wet--or the upper planking shellac was still sticky --maybe the lead couldn't find the key to unlock the rope blocking the stairway entrance.....maybe guests had been slipping on the humid wet stair steps and Disney hadn't installed the non-skid strips yet........you never know....maybe WED was storing the Thunder Mesa models up there that month......LOL. I love how you cover the obscure things that most people don’t even give a thought about. 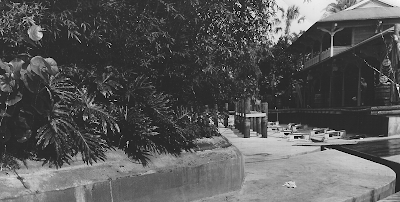 I like looking through old images of the parks as well and try to piece together changes both large and small to the various buildings, structures, landscape and layout that have occurred through the years at the Magic Kingdom and Disneyland. As always, your articles are a great joy to read. As always, your articles are a great joy to read. in the haunted mansion picture, there is a person wearing a black and white stripe shirt with a tan hat and they look like a cast member from small world. 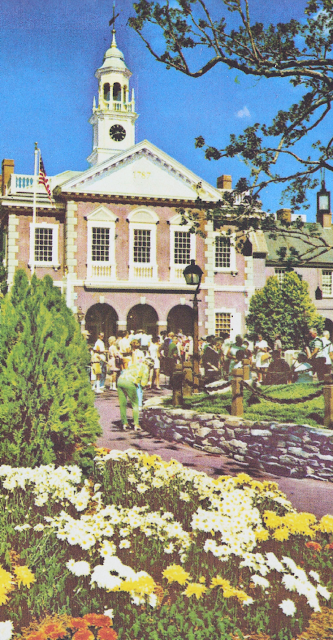 I grew up in Tampa, and my family went to WDW roughly every week from opening day through the late '70's. I knew that place like my own house. We had good tricks, too, like always parking in the lot at the Contemporary, having breakfast there, and using our tickets in comfort without the wait at the T&T center (this was when security rarely asked if you were staying at the hotel). I was a teenager when my southern California high school band got to to march in a parade at a pretty new WDW Magic Kingdom. 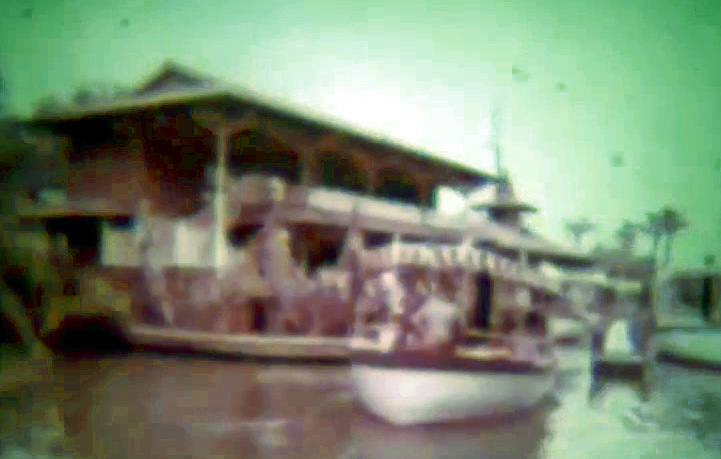 I remember the Jungle Cruise line winding around downstairs and upstairs. I remember looking down at people boarding, which was not a view we had back home at Disneyland. It was a great first trip. We weren't used to the heat and humidity and every time a thunder shower would roll through (ahhh, so that's why so many more waiting areas had some sort of roof! ), all of us would run out and get soaked, hoping that would cool us off a little. Thanks for your wonderful site! I just found it and am enjoying it very much! Super sleuthing! Lovely melding of old and new data. I can remember my first encounter with the tikis. It was a band trip in high school. The trouble is, I can't remember exactly when, but would be between 1977 and 1981. I remember because the tikis played one of our favorite drum cadences we called "Africano." 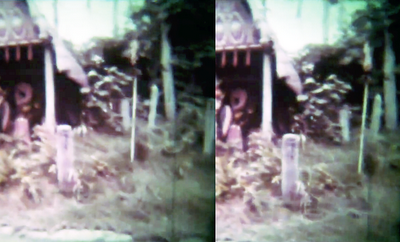 My recollection is that the tikis were new. As this would have been my fourth of fifth visit to the park. I, too, remember going upstairs at the Jungle Cruise on multiple occasions. I remember standing in line and then getting to the stairs and thinking, "Oh, crap, that's right.. This line winds it's way around upstairs.."